A small town two hours from Bengaluru is unsubtle in signalling its main attraction: a giant cut-out of Shivakumara Swami stands in the heart of Tumkur town. For almost a century, the powerful Siddaganga mutt (seminary), one of the biggest Lingayat centres in Karnataka, has been based here. Its influence is explicit. Much of the terrain is tenanted by images and posters commemorating the Swami's 111th birthday. He is the chief of the mutt, among the ten most prominent of a thousand Lingayat seminaries that are spread across Karnataka. The Lingayats form 17 percent of the population, though a census a few years ago that was leaked but not officially reported downsized them to 13%. Historically, they have been power players on account of not just their numbers but for three decades, they have backed the BJP, partly because its biggest leader in Karnataka, BS Yeddyurappa, is one of their own. But in the next election, due in five weeks, the Congress has thrown a wrench into the works. Its Chief Minister Siddaramaiah has called for the Lingayats to be recognized as an entire religion separate from Hinduism - like Jains or Buddhists - in a move designed to end the Lingayat loyalty to the BJP. Under Shivakumara Swami, the mutt in Tumkur, once a small ashram, has grown into a vast, sprawling estate with large land - and several educational institutions attached to it. Central to the Lingayat tradition is the emphasis on education - the bigger mutts have several schools, colleges and hostels linked to them - recognition as a minority religion would entitle them to central government funding that they can disperse according to their own guidelines. "Shivakumara Swami-ji speaks English and has ensured high literacy levels amongst his followers," says Anand, a devotee who has arrived in Tumkur with a busload of relatives in the hope of a darshan with or glimpse of the Swami. "In our tradition, we don't worship gurus blindly, we do so because these are enlightened, educated people who speak rationally and speak of an inclusive society." The Lingayats were formed as a sect in the 12th century by a social reformer, Basavanna, who rejected the caste system and other rituals of Hinduism. They have long contended that they must not be treated as a subset of Hindus. Championing their demand would put the BJP at odds with the party's ideological mentor, the Rashtriya Swayamsevak Sangh or RSS, which holds a unified Hindu society as an important ideal. With the Congress asking the central government to recognize the Lingayats as a religion, the reactions of different mutts are being closely gauged by both the Congress and the BJP, mainly in private conferrals. 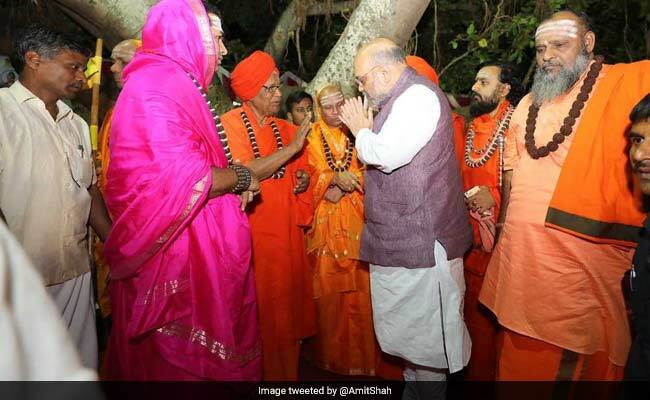 The head of the powerful Chittradurga Mutt recently sent a letter of support for the Congress' decision, that too shortly after BJP chief Amit Shah's visit to the seminary. 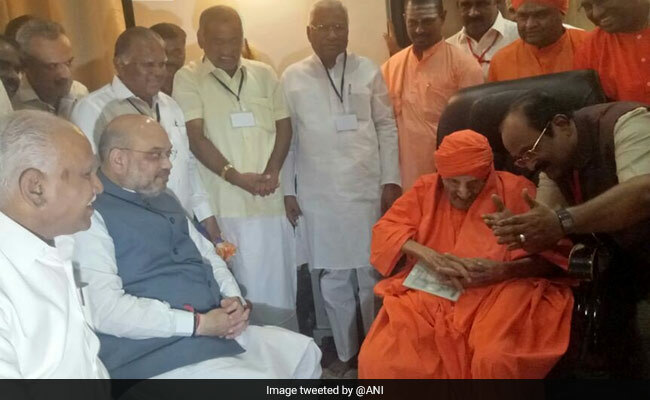 So far, the Siddiganga mutt in Tumkur has refused to publicly offer its reaction despite house calls from both Amit Shah and top Congress leaders to Shivakumara Swami. MB Patil, a minister in the Congress government and a Lingayat himself, has been spearheading the movement for its recognition as a religion. At his plush residence in Bengaluru, there is a constant flow of Congress MLAs and workers from the Lingayat community. 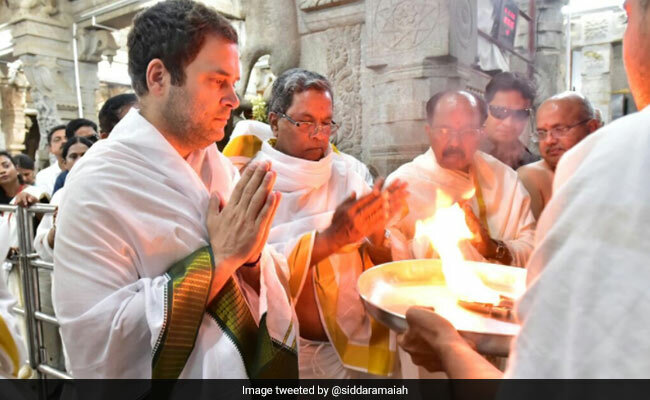 Shiv Shankar, from Basavakalyan, the birthplace of Basavanna, says, "We want to make sure our people everywhere understand that the Congress is trying to give us our religion back. Minority religious status will allow us to give more seats to our community in the institutions we ourselves have created." Mobilizing the community around key Lingayat issues like that of a separate religion is being done in many ways. The Rashtriya Bassava Sena, named after the 12th century saint whom the Lingayats see as the founder of their movement, was officially registered three months ago. The organization's members say they have no political affiliation, but it's being promoted by Congress leaders and its office now doubles up as the Congress war-room for the election on May 14. SM Jamdar, a retired bureaucrat who is one of the key figures in the movement for a separate status, said the Bassava Sena is fashioned as a cultural organization that will work amongst the Lingayat youth to counter the RSS. 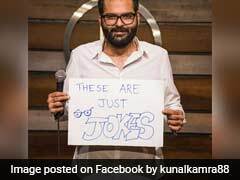 The Sena's General Secretary, AP Bassarajai, who is also a leader of the Congress' youth wing, tells NDTV, "At the moment, we've stopped enrollment as the model code of conduct is set in place and we don't want it to seem like our movement is all about politics, when it is about spreading the true message of Bassava, the founder of our faith." The BJP's response to the Congress' move has been muted. BS Yeddyurappa, who is running for Chief Minister against Siddaramaiah, has refused to elaborate the BJP's stand on the Lingayat issue and leaves it to media in-charge and party spokesperson S Prakash, to field questions. "We do not see any impact favourable to the Congress party. 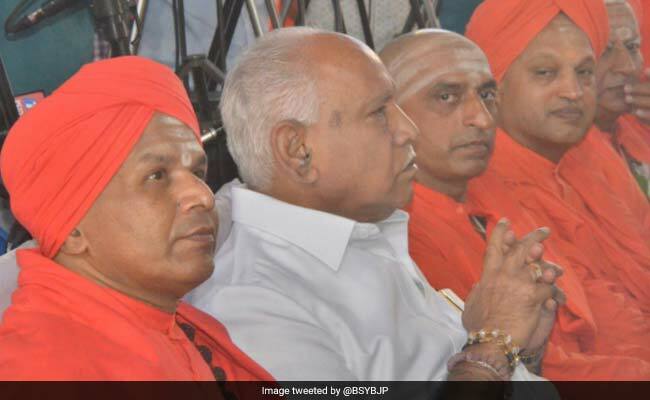 It is always Yeddyurappa who is seen as the tallest Lingayat leader. Siddaramaiah, to deny Yeddyurappa chief ministership and to wean away the Lingayat vote, has created this division." Though the idea of any sect leaving the Hindu fold is anathema to its ideology, the BJP knows the stakes are too high to oppose the idea of a separate Lingayat faith. Instead, it is riding on the opposition of the Veerashaivas. The Veerashaivas are loosely termed a subsect of the Lingayats, but differences in doctrine and caste composition have exacerbated the schism over the past few decades. The Veerashaivas subscribe to Hindu rituals and the Vedas, unlike the Lingayats. At the Veerashaiva Mahasabha office, which administers the community, its General Secretary, HM Prasanna, calls Siddaramaiah's recommendation for a separate religion "unconstitutional". The recommendation defines Lingayatism as a separate religion for Lingayats and all those who believe in the primacy of Basavanna. For the Veerashaivas, the social reform is important but one of many sharanas or saints they believe in. In support of his stand, Prassanna points to an earlier demand for a new religion in 2013, which used the term "Veerashaiva-Lingayat" but which did not emphasize Basavanna's status as the founder. "Sonia Gandhi had come to our office," he says, pointing to huge blow-up of a picture, covering half a wall, of her with the members of the Veerashaiva Mutt. 'She had endorsed our decision for the new religion that is still pending. The Congress government says it has been rejected, but that's untrue...so now why are they talking about taking Veerashaivas out of the new religion?" The issue is not cleanly divided along party lines either. The president of the Mahasabha is a Congress leader, Dr Shamanur Shivashankarappa; he claims, "Siddaramaiah is being unconstitutional in this. We believe in the new religion, but only if that clause is removed. We are followers of Basavanna but also the sharanas. As the recommendation stands today, we cannot accept it." On the ground, many in both communities use the term interchangeably. It is a complexity carried over into the mutt structures, most which have both Veerashaiva and Lingayat followers. The pictures of the Siddiganga seer, Shivakumara Swami, hangs prominently at the Veerashaiva Mahasabha. His views on the issue, then, have become very critical. But it is unlikely that they will be publicly voiced during this campaign. While Shivakumara Swamiji is too old to face questions, at the mutt, his junior is categorical that he will not comment on the issue. But he indicates that the Swami-ji does not favour schisms between the Veerashaivas and the Lingayats. The Congress may believe it has checkmated the BJP on the issue; the tallest Lingayat influencers may need much more persuasion.